To safeguard the fiscal stability of Puerto Rico and promote its competitiveness in order to transform our economy into one of the most developed economies in the world, hence, fostering the social and economic enhancement of our people. On February 1, 2016, the Working Group for the Fiscal and Economic Recovery of Puerto Rico (the Working Group) released its Restructuring Proposal, which was later revised in response to counterproposals and feedback from many of the Commonwealth's different creditor groups (view the Puerto Rico Restructuring Counterproposal). 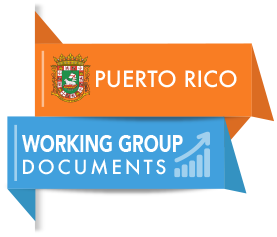 Previously, on September 9, 2015, the Working Group--created by Executive Order of the Governor of Puerto Rico--made public its Fiscal and Economic Growth Plan (updated on January 18, 2016) along with a Commonwealth of Puerto Rico Liquidity Update prepared by the firm Conway MacKenzie. The creation of the Working Group, as well as the subsequent development of its Fiscal and Economic Growth Plan, was in direct response to the findings of the Commonwealth's fiscal and economic situation and the sustainability of its debt as presented in the report: Puerto Rico - A Way Forward (6/29/15, updated as of 7/13/15) by former IMF economists Dr. Anne O. Krueger, Dr. Ranjit Teja, and Dr. Andrew Wolfe (the Krueger Report). The José M. Berrocal Institute for Economics and Finance is a GDB subsidiary created to complement the Bank's mission of promoting economic development by providing specialized training on the theory and practice of public finances and economics to talented young professionals in order to attract them to join the public service. An eight-week Summer Internship Program is the Berrocal Institute’s main initiative towards this goal. To find out more about the Berrocal Institute, visit the Institute’s webpage. This presentation features the Berrocal Institute’s historic background and mission, as well as the objectives, structure, requirements and calendar of its Summer Internship Program. The Municipal Finance Corporation, known by its Spanish acronym COFIM, is a newly created public corporation and instrumentality of the Commonwealth of Puerto Rico, attached to the Government Development Bank. COFIM is authorized to issue bonds and use other financing mechanisms to pay or refinance, directly or indirectly, in whole or in part, the debts of the municipalities of the Commonwealth payable or backed by the 1% municipal sales and use tax. COFIM was created pursuant to Act 19 of January 24, 2014, which contemplates a new collection method for the 1% municipal SUT that will become effective on September 1, 2014. COFIM will be responsible for running the development of an integrated collection structure that will guarantee funds are received and provide detailed information about such funds. As part of this effort, a group of municipalities will form part of a pilot program for filing new municipal SUT returns and paying the municipal SUT. Read a Fact Sheet about COFIM and the new collection structure. For more information on the Municipal Finance Corporation as an entity attached to the GDB, visit the COFIM webpage in the GDB website. Merchants, you may file the Municipal SUT return and make payments through COFIM's new website at www.cofim.pr.gov. International Bank Account Number (IBAN) is an internationally system of identifying bank accounts. It was originally adopted by the European Committee for Banking Standards (ECBS), and later as an international standard under ISO 13616:1997. The current standard is ISO 13616:2007, which indicates SWIFT as the formal registrar. Only the bank servicing an account can provide the correct International Bank Account Number (IBAN) of that account and the related bank identifier code (BIC), additionally IBAN number validity also can be checked for correctness to avoid typing errors. In order to incentivize the refinancing of properties, Act 129-2014 amended Act 87 of 1965 to establish incentives for the payment of internal revenue stamps and registration vouchers required when obtaining a mortgage loan. Act 129 allows that deeds of mortgage for refinancing of properties under the Mortgage Loan Insurance Program be exempted, through the Ahorro Hipotecario product, from payment and cancellation of internal revenue stamps and vouchers required by law in the execution of public documents. In addition, for deeds of cancellation of preferred mortgages, a 50% exemption from payment of internal revenue stamps and vouchers is granted. For more information about the Ahorro Hipotecario product, contact your preferred mortgage bank or credit union. of updates to this website.